James Flanagan appears in the title role of ‘Phaeton’, playing at the Taffety Punk Theatre Company through May 28. The Taffety Punk theatre group is one of the smallest but mightiest acting groups in the DC theatre scene. This impressive band of professional actors, dancers, and musicians applies the punk rock concept of “the ensemble” to its work, insisting that artists are at their best when they evolve together in groups. If their newest production, Phaeton, is any measure, it would appear that their ensemble theory is working. Showing at the Capitol Hill Arts Workshop through May 28, this tense, compelling revamp of an ancient tale offers a rich melting pot of the Greek, the Biblical, the Shakespearean and more—one that satiates the questions we’re all asking—of identity, potential, and purpose. This admirable group has worked hard to remove any obstacle to your experiencing life-enriching, entertaining and artful storytelling in Phaeton. 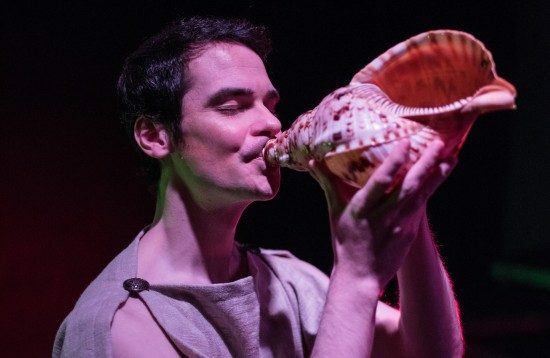 Written by Michael Milligan, directed by Marcus Kyd and Chris Curtis, and based on the ancient Greek myth, Phaeton tells the story of a young man’s struggle to uncover the truth of his allegedly divine origins, and in doing so, to find his life’s purpose in an unjust world. The play opens on a jubilant wedding day. Greece’s King Thetis has just won a long series of costly wars, and intends to marry Phaeton’s beautiful mother, Clymene, as a way of signaling a new era of peace in the war-torn country. But when a more sinister plot is uncovered, Phaeton must act quickly to learn the truth of his powers, in order to protect the people and country he loves. Milligan’s adaptation builds out the ancient Greek legend into a full-blown epic, with a complete cast of 11 intricate characters, and an expansive, volatile plot. The script reads a lot like Shakespeare, in both its prose and literary elements, with plenty of tragedy, mysticism, mistaken identity, treachery, and wit to go around. In a refreshing twist of perspective, it’s women who uphold the narrative backbone of this production. Most of the play’s pivotal moments are relayed to the audience through the faces and voices of Clymene’s squad of nurses and attendants. It’s not an especially Shakespearean trend to enlist a majority female cast, and Milligan’s break with tradition here is an appropriate and rewarding one—these women are some of the most complex and hysterical characters the play has to offer. The entire limber cast demonstrated team cohesion in both its physical coordination and in interactions between actors. James Flanagan won the audience’s sympathy, presenting a compassionate but deeply troubled Phaeton, torn between his earthly and divine identities and allegiances. Julia Brandeberry accomplished the same with an equally beleaguered Clymene. Dan Crane was a stirring villain, presenting a treacherous, emotionally charged Thrasymachus, and Karin Rosnizeck’s role as Threasymachus’ jaded nurse got many of the play’s zingers, and she delivered each with plenty of attitude, to audience delight. Slow and expressive group choreography by Kelly King is memorably employed to express characters’ deepest internal conflicts, and to embody the persona of the divine. In moments that at times look something like a slow-motion game of blob tag, the entire cast moves as one to articulate the emotions and expressions exchanged as characters confront the booming voice of a god, piped through overhead. Practically no set is used, beyond a group of varied platforms along the back and side walls, and a series of gymnastics rings. Stage manager, Megan Ball, keeps things exposed, allowing the actors themselves to frame the story. Bold, colored, and flash lighting by Chris Curtis helps delineate the divine from the Earthly, and energize the clashes between them. The intimate, back room theatre space of the Capitol Hill Arts Workshop serves to wrap up the audience in the tale, as actors come within a few feet of the front row and frequently extend their stage into the center aisle. Such an up-close experience is even more rewarding to be let in on, considering Taffety Punk’s commitment to affordable theatre for all. This admirable group has worked hard to remove any obstacle to your experiencing life-enriching, entertaining and artful storytelling in Phaeton. So what are you waiting for? Running Time: 2 hours, with a 10 minute intermission. Phaeton continues through May 28 at the Capitol Hill Arts Workshop, 545 7th St SE, Washington, DC 20003. For tickets and for information, call (202) 355-9441 or click here. Derek Schwabe has lived in Washington DC—on and off the hill—for three years. A New Jersey native, Derek has always valued music and theatre, in spite of his wonky background. His own stage experience has been equally divided between drama and choral performance. Elated to have the Maryland Theatre Guide as his creative outlet, he works on hunger and poverty policy by day at Bread for the World.